I've been busy building kits over the past year, but this is my first WIP in a while. The past month or so has been about painting and weathering which though I love to do, it's been too long. 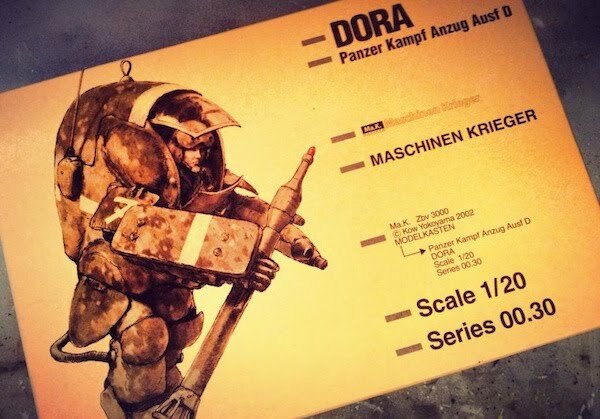 The DORA is another of my favorite suit, so I'm exited to get it started. Now that Dora is partially assembled and primed I'm ready to lay down some paint. Not sure what I'm doing yet though. I'm considering going with the one of the patters from the camo card; my favorite being the one depicted on the cover. But then again I'm thinking of going with one of my own. It may just come down to the flip of a coin. First step and area in hand painting- the engine. The entire piece is painted with Mr. Metal Color Dark Iron and Stainless. The toothbrush made soft by brushing down my teeth to the gums is used to buff the Mr Metal Color paints when dry to a nice luster. Some of the pipes and connections are painted Floquil Weathered Black and other parts painted with Gaia Color Oxide Red. Next up is filters and slight weathering using AK Interactive smack. I used AK's 076, Filter for NATO Tanks to warm the steel and iron finish up. 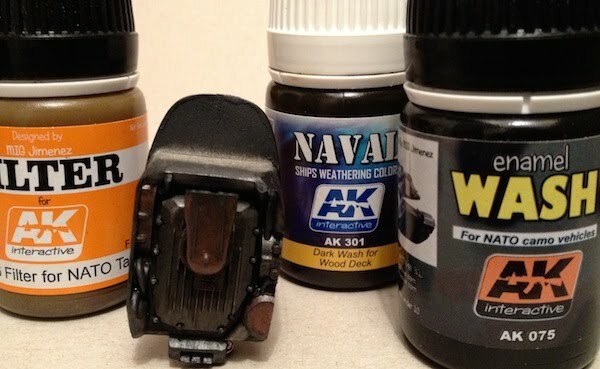 AK's Dark Wash for wood decks and wash for NATO camo vehicles for some subtle grime and depth. Next step will be to uses AK's Engine grime and oil. 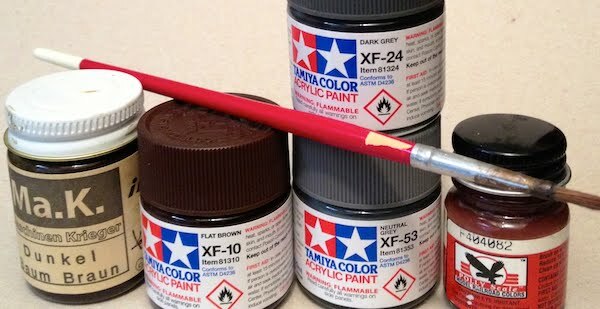 The reason for the metallic base coat- the idea is that when I scuff or chip the finished coat, the steel brown finish will show as well as give the final coat some depth. For the interior I used the Gaia lacquer with the Tamiya over it. Then the back rest in Testors Model master enamel Leather thinned with white spirits. Lastly, the AK filter for the entire interior. Basically, I painted the suit up with what you see below thinned with Mr Leveler for the camo and ID band. For brown, Ma.K. Dunkel Baum Braun followed by random spots of Tamiya Flat Brown. Grey base done in Dark Grey followed by Neutral Grey in spots. ID band in Polly Scale Railroad colour paint. I pre-weather my builds with a wash before adding decals. This is so there's colour variation below the decal's clear outline as well to the overall surface of the build. I find this step helps blends the decal with the surface. Also, the oil wash acts as a filter as well and helps add some streaking when I pull it off with cotton buds. When I did though, out from the can (to my surprise) came silver! Apparently, during a frantic clean up session at the bench about a month ago, I must have mixed up the spray caps at some point and put a clear can cap on silver spray can. Oh, the horror! Sorry, but the pictures of the stupidity are to graphic to post. Luckily, it was just the back of the suit that I hit first. AND I didn't have the engine installed yet. I had to move fast to remove the silver paint. 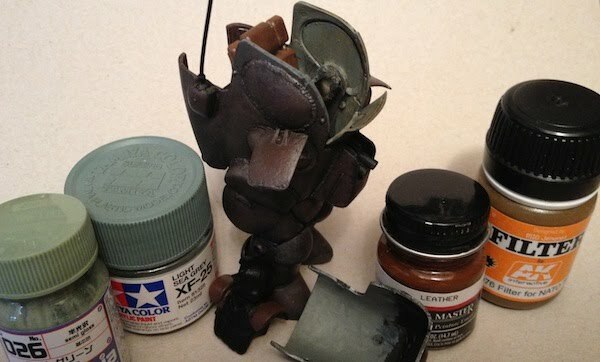 Along with it came much of the pre-weathering and base coat layer (even though I used lacquers for that part). The white spirits ate through most the layers and I had to re-apply the colour that was stripped. I lost many of the things I liked about the finish. However, I gained some interesting and subtle effects because I had to use the white spirits and repaint areas that got stripped down to the primmer. As far as this being a useful WIP (if it was ever such), lack of documentation of how I fixed the spray paint is not documented. This is a WIP FAIL.